As was written, the study and analysis of gamma ray spectra for scientific and technical use is called gamma spectroscopy, and gamma ray spectrometers are the instruments which observe and collect such data. A gamma ray spectrometer (GRS) is a sophisticated device for measuring the energy distribution of gamma radiation. For the measurement of gamma rays above several hundred keV, there are two detector categories of major importance, inorganic scintillators as NaI(Tl) and semiconductor detectors. In the previous articles, we described the gamma spectroscopy using scintillation detector, which consists of a suitable scintillator crystal, a photomultiplier tube, and a circuit for measuring the height of the pulses produced by the photomultiplier. The advantages of a scintillation counter are its efficiency (large size and high density) and the high precision and counting rates that are possible. Due to the high atomic number of iodine, a large number of all interactions will result in complete absorption of gamma-ray energy, so the photo fraction will be high. But if a perfect energy resolution is required, we have to use germanium-based detector, such as the HPGe detector. Germanium-based semiconductor detectors are most commonly used where a very good energy resolution is required, especially for gamma spectroscopy, as well as x-ray spectroscopy. 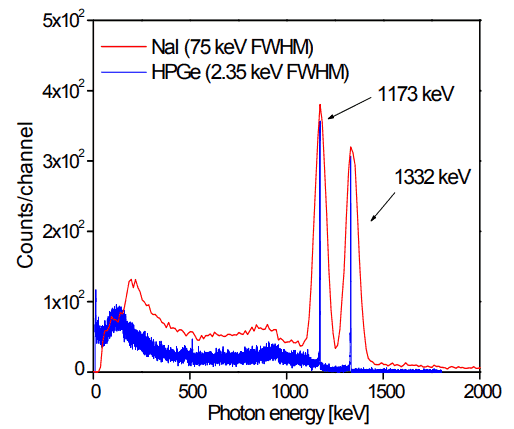 In gamma spectroscopy, germanium is preferred due to its atomic number being much higher than silicon and which increases the probability of gamma ray interaction. Moreover, germanium has lower average energy necessary to create an electron-hole pair, which is 3.6 eV for silicon and 2.9 eV for germanium. This also provides the latter a better resolution in energy. The FWHM (full width at half maximum) for germanium detectors is a function of energy. For a 1.3 MeV photon, the FWHM is 2.1 keV, which is very low. Photopeaks are full energy peaks, that are created, when γ-ray transfers its full energy (hω −Ebinding) into the sensitive material (scintillation crystal or germanium crystal). Than a single delta function should be observed in the spectrum.The cobalt-60 spectrum contains two photopeaks, one at 1173.2 keV and another at 1332.5 keV. Compton Continuum. In the crystal, a gamma ray undergoes a number of interactions, but for intermediate energies compton scattering dominates. In compton scattering, the incident gamma ray photon is deflected through an angle Θ with respect to its original direction. The photon transfers a portion of its energy to the recoil electron. The energy transferred to the recoil electron can vary from zero to a large fraction (maximum E) of the incident gamma ray energy, because all angles of scattering are possible. The size of the scintillation crystal changes the ratio between photopeak and Compton continuum. For an infinitely large spherical detector centered around a source no photons would be able to escape and only a photopeak would be seen on the spectrum. For very small detectors the chance for a photon to leave after Compton scattering is high and the Compton continuum would be large compared to the photopeak. Compton Edge. The Compton edge is a feature of the spectrograph that results from the Compton scattering in the scintillator or detector. This feature is due to photons that undergo Compton scattering with a scattering angle of 180° and then escape the detector. When a gamma ray scatters off the detector and escapes, only a fraction of its initial energy can be deposited in the sensitive layer of the detector. It depends on the scattering angle of the photon, how much energy will be deposited in the detector. This leads to a spectrum of energies. The Compton edge energy corresponds to full backscattered photon. The counts between Compton edge and the photopeaks are caused by multiple Compton scattering events, where scattered gamma photon exits the sensitive material. Compton edge of 60Co on gamma spectrometer Na(Tl). Backscatter Peak. A Compton backscatter peak is found when γ-rays enter the material around the detector and are scattered back into the detector. Gamma photon can interact by Compton mechanism in shield or surrounding materials and is backscattered out of a material into sensitive volume. Maximum photon energy in this interaction is ~200 keV regardless of initial photon energy. This results in a secondary peak at -200 keV. X-ray Peaks. When the gamma rays undergoes photoelectric effect in surrounding materials (for example lead shield) the outgoing X-ray can be captured again by the detector. This gives an characteristic X-ray peak with an energy depending on the material it came from. In case of lead the characteristic X-ray energies is in the 72-84 keV range. Photoelectric absorption by K-shell electron in lead of shielding, resulting in a K-shell vacancy. The K -> L transition for lead = 72 keV. If this characteristic x-ray is absorbed in the crystal then a secondary peak at 72 keV is observed. Coincidence Peak. Simultaneous absorption of two gamma photons in crystal, resulting in a peak higher in energy than the photopeak. The gamma photons may result from serial isomeric transitions (e.g. 2 keV plus 1332.5 keV in case of cobalt-60) or simultaneous decays in separate radionuclides (e.g. 2 x 1173.2 keV in case of cobalt-60). Annihilation Peak. For high energy gamma rays (greater than 1.02 MeV), electron-positron pair production is a possible interaction. But a positron may then annihilate in the detector or in the surrounding material. If both 0.51 MeV annihilation photons are absorbed in the crystal, a secondary peak 1.02 MeV below the photopeak can be found. If one annihilation photon is absorbed and the second exits the crystal, then 0.51 MeV is removed from the photopeak, resulting in a secondary peak 0.51 MeV below the photopeak. The probability is greater that one annihilation photon will be absorbed.